Only Two Days Till FanFest!! I am soooo excited about FanFest!!! I can’t believe that it’s only two days away. I’m going to have so much fun, and I’m so happy that I get to go to Petco Park this weekend. Best place ever. Even though it’s pretty much the same events as last year, I’m still super excited to get out there and recharge my fanhood. It’s been way too long since I’ve seen any baseball, and this is pretty much a celebration of our boys getting ready to get out there and win a title for us. Hyun Young and I are really hoping to get Mat Latos’ autograph. Out of all the guys on our team, this is one of the most amazing rising stars, and I feel like his autograph is going to be worth a lot someday. I would say that he’s the next Jake Peavy but…look how he turned out. I’m also excited to see the clubhouse again. I’ve taken the tour twice, but it still has the awe of the first time. 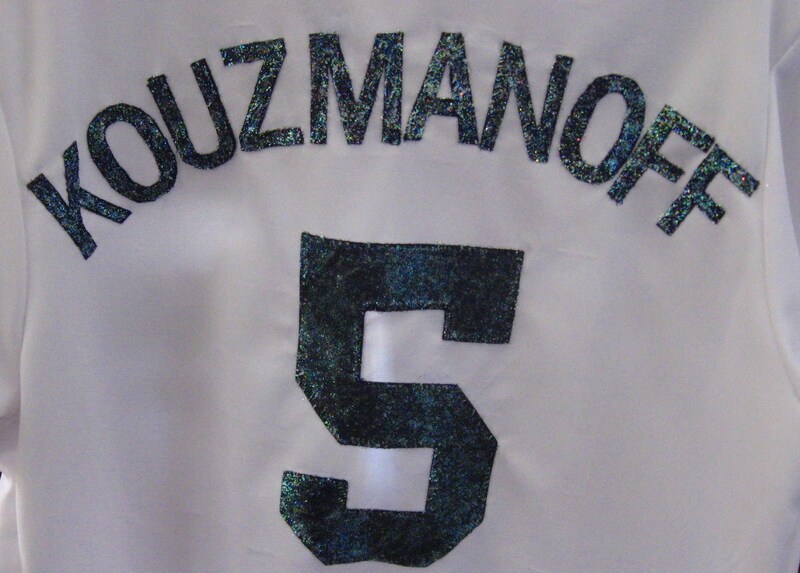 Just thinking about the kind of legends that have stood in that clubhouse, like Trevor Hoffman and Kevin Kouzmanoff. 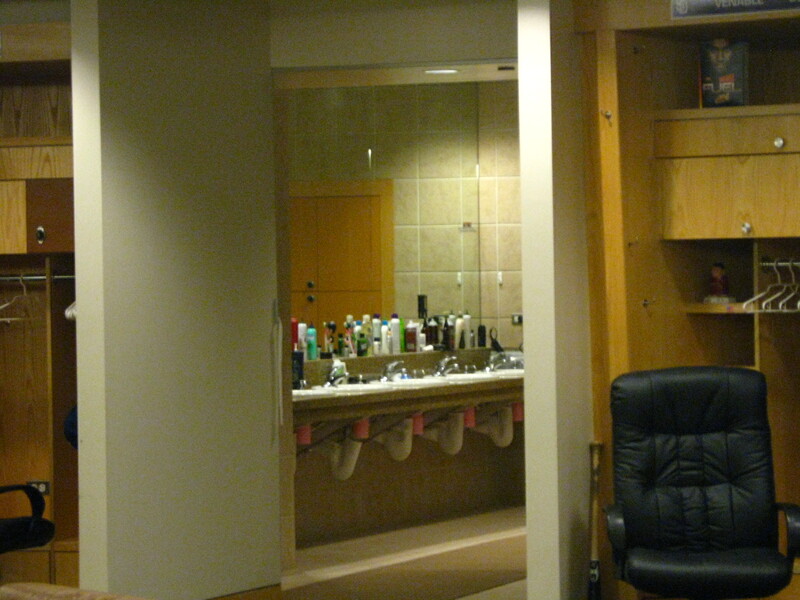 Just to think that my baby spent a ton of time in that room…wow. It makes me want to scream or faint or something. That is a very special place. I really hope that there’s a lot of good stuff at the garage sale, too. 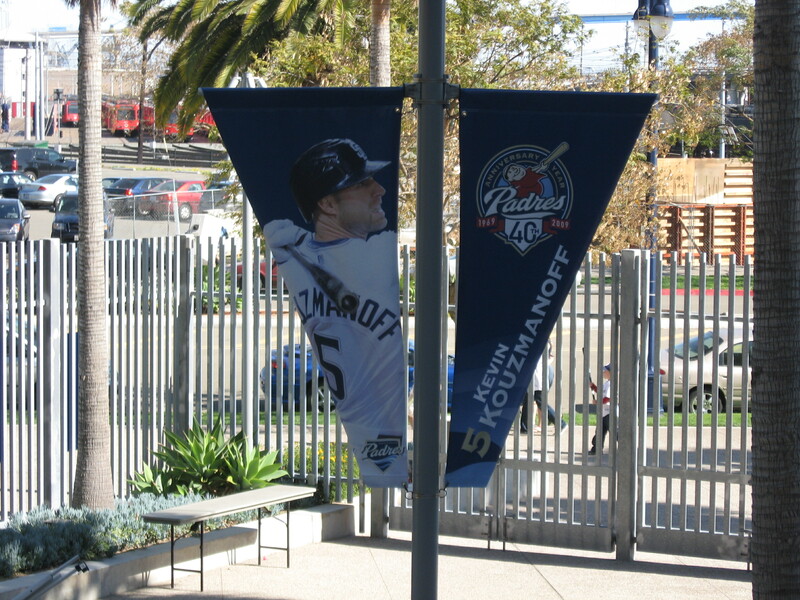 Last year I got a Kevin Kouzmanoff banner that had been hanging on one of the lampposts (until they traded him of course). It’s super cool, and I hope that I can find more Kouz stuff and anything else interesting. And of course, the best part about FanFest is meeting up with other fans who are just as crazy about the Padres as I am! I hope to meet and re-meet a ton of people this year, including but not limited to Hyun Young, John, Gaslamp Ball people, RJ’s Fro people, Twitter people, and Friarhood people. Especially since Hyun Young and I have a very special plan. I can’t wait. It’s going to be such a fun day!! Saturday’s Padres FanFest was incredible. Oh my goodness. I had a BLAST!! We walked the short distance to the ballpark and then walked and walked and walked to try to find the end of the line. 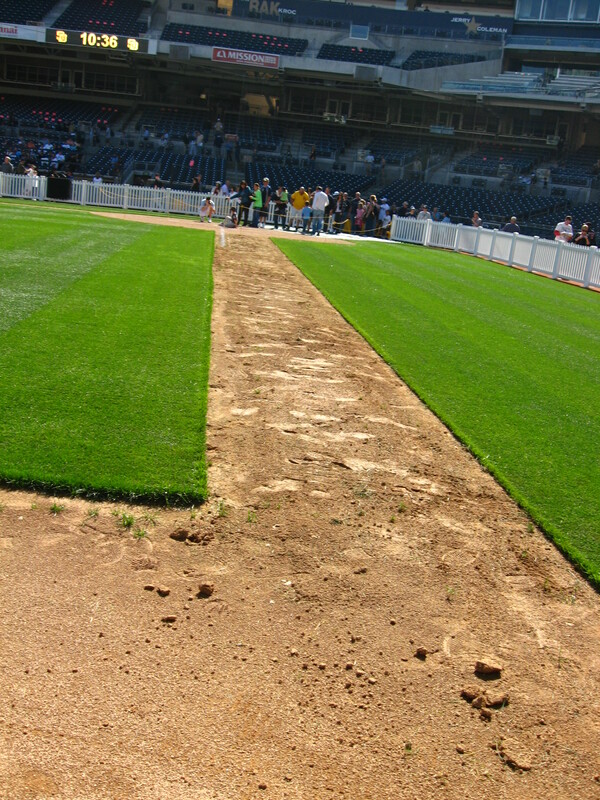 It started at Home Plate gate and went all the way around almost to the Padres store area on the left field side. Whoo. We met up with Hyun Young and checked out the schedule and stuff and discussed what we wanted to do. We decided that we wanted to go for the Hairston Brothers autograph session which was from 12:30-1:30. Once the line got moving, it didn’t take long at all to get inside. Once we did, I realized that it might be a little challenging to get our tickets for the autograph session. I didn’t agree with the way they distributed those at all. Basically, I think they had to run out of the first few sessions before they put up new ones. So we had no idea of knowing when the Hairston session would become available, and there’s no way we were just going to sit there and wait for it. So, we decided to jump on the clubhouse tour right away and come back to try to get the Hairstons later. I think we were in the first round of people of the day for the clubhouse tour, which was really nice because it wasn’t too crowded at all. We walked down the long hallway that was flanked by doors on each side. Some of them were labeled, like the family room and x-ray room, but a lot of them were left to the imagination. We went into the weight room, which is so impressive. Some of that stuff is massive! It would be so cool to have access to that kind of equiptment all the time. 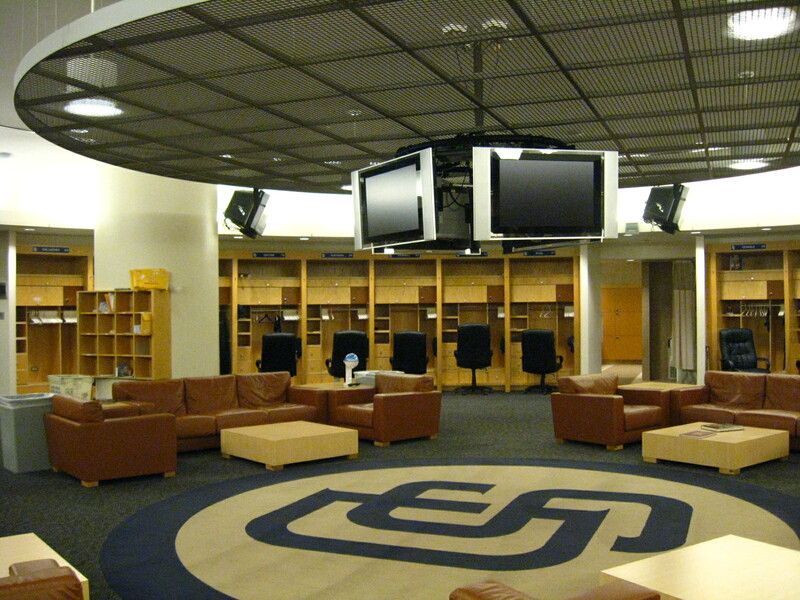 Then we went into the hall that led to the main attraction: the clubhouse itself, the home of our San Diego Padres! I’d been in there before, but it was so cool to see it again! I was shocked and thrilled to see an empty locker on one side of the room that had a nameplate saying “Hoffman 51” on it. That’s so cool!!! I thought that was a great tribute to our guy who needs to come back now. I heard a lady say, “They’d better never take that down.” I agree completely. We spent a lot of time in the clubhouse, taking pictures. There was some very interesting stuff in Everth Cabrera’s locker: an “I Heart Nicaragua” sticker and a picture of Kouz. Hmmm. And we thought it was women who were so worried about their appearance! I don’t know if you can see it, but there’s actually an Adrian Gonzalez toothbrush holder in there. LOL!! We walked down the third base line and decided to get out pictures taken at home plate. As we stood in line, Ted Leitner walked right past us! I didn’t get a chance to say hi, but that was very cool. I believe that we went to check for the HairBros session again, but it wasn’t there. We decided to grab a ticket for an Everth Cabrera signing, just so that we were sure to get an autograph if the HairBros didn’t work out. After we got that, we went to the Padres Garage Sale. 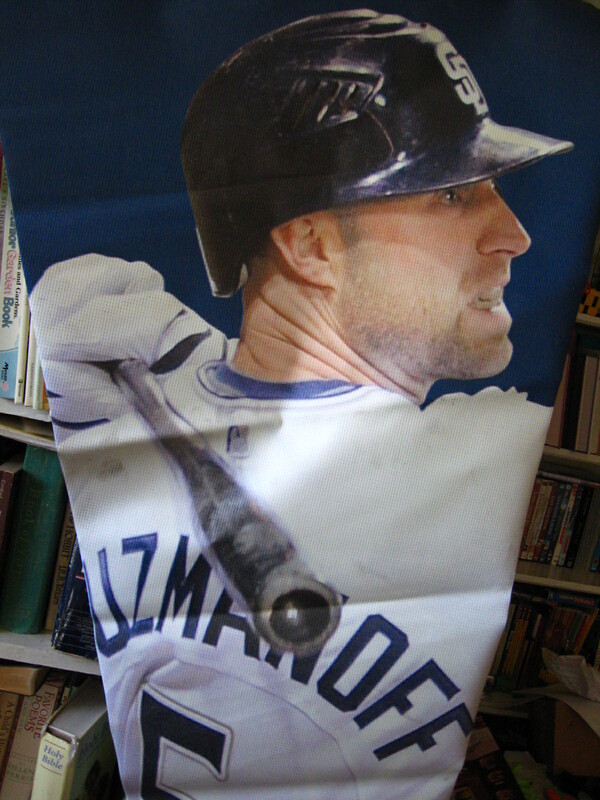 Earlier, we had seen a lady looking at a Kevin Kouzmanoff banner thingy while we were walking on the concourse. I was like, ahhh I have to go get that! So once we got into the Garage Sale, I went straight for that front porch thingy to look for it. My sister found it for me. So epic! I’m so glad I was able to get it, but it was filthy! Not the best thing to be carrying around while wearing a white jersey. And this is the actual one that I bought. Who knows? This might have been the one hanging there! I also bought a reusable “green” bag that said “Padres Foundation” on it because I never have a big enough bag for all my stuff. Especially when I go to Petco Park. But the selection of stuff this year wasn’t as good as last years, I thought. While we were “shopping” we bumped into John from The Friar Faithful. It was really cool to meet him! Next we decided to check out the Media Zone and met the guys from RJ’s Fro on the way over. They were super cool, and we said “I like BBQ” to them and they gave us these sweet posters signed by the RJ himself, Randy Jones! Thanks so much guys!! We all decided to go talk to Corey Brock, so we hung out around there for a long time and met the guys from Gaslamp Ball. Now that was seriously cool. It was like a mini-Padres-bloggers meetup, in the media zone, no less! Wow. Anyways, all those guys are very cool and I had a lot of fun talking with them. Man I love Padres bloggers. Hyun Young and I decided to go try for the HairBros again, but I think we got distracted by taking pictures of players who were in other autograph sessions. 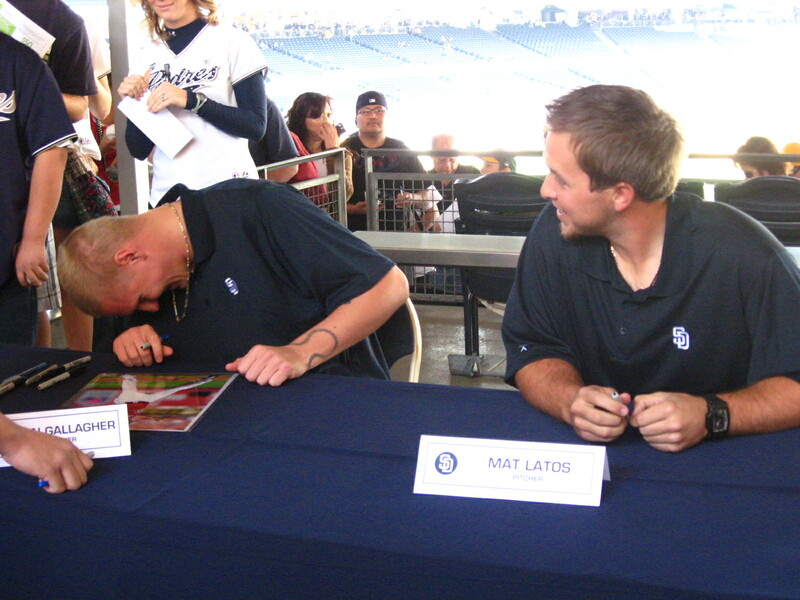 Mat Latos and Sean Gallagher cracked me up. They switched nameplates and looked like they were having a lot of fun. I love Mat Latos, and I think he’s my new favorite pitcher. Can’t wait to see him pitch a whole season! I think we walked down to the field again (I don’t remember why) and then we came back up and spent some time at the 4SD area. Hyun Young got her picture taken with Mark Neely and I got a Cox keychain. At least it wasn’t the sunscreen. It was kind of cool because Adrian and his wife Betsy walked right by and went in the middle of a crowded concourse. I mean, that’s not something you see everyday: the face of the organization walking among the fans. I thought that was pretty cool. So then I got a lemonade and we went to the Everth line to wait for our autographs. It wasn’t that long of a wait at all. There was this mom behind us who was telling her little son about who’s autograph they were going to get. Then Everth walked by, and the little kid was like, who’s that? His mom went, he’s Everth Cabrera, we’re going to get his autograph. And the kid goes, “Him? I HATE him! !” I was cracking up. Haha it was great! We got Carlos Hernandez and Everth Cabrera’s autographs, which was pretty cool. Everth was pretty shy, but he’s adorable. We took more pictures of players who were signing, but we just missed taking pictures of the HairBros at their session. Sigh. But then we decided to go watch their Q&A session, and I thought that I would FINALLY be able to see them! The front office session was just ending when we got there, and we met Steve from the Friarhood and talked with him for a while. That was so cool! 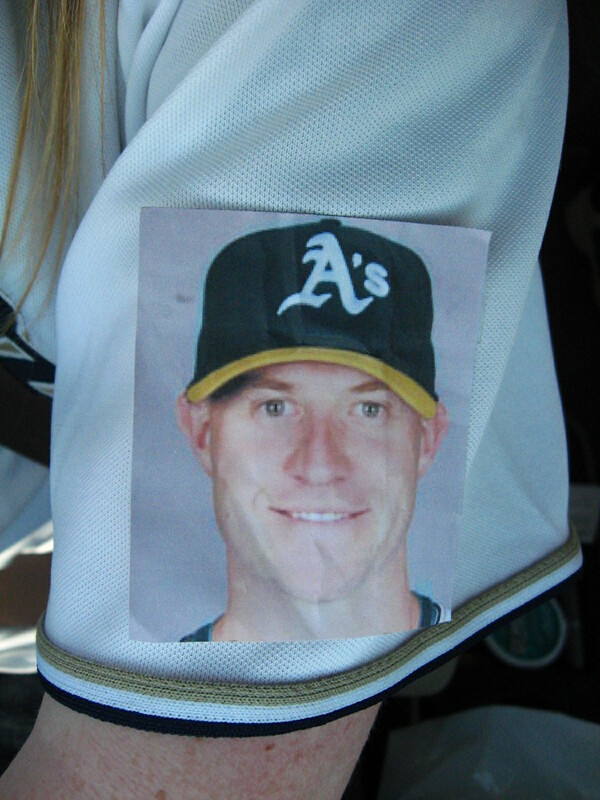 He loved my jersey and picture of Kouz. We settled down for the Q&A session. And then my phone rang. My mom said that we needed to meet her at the stairs at 2, which was when the session was supposed to start. Sigh. As we walked out, I passed right by Mat Latos! I couldn’t really see who it was at first because I was walking into the sun, and then suddenly I saw that tattoos on his arm, and I was like, it’s Mat Latos! He was probably like five inches away. I didn’t have time to react to say anything, but it was still pretty cool. What a great event. Petco really felt like home that day. I felt so comfortable and like I belonged there. I loved how open the place was. I mean, we could go almost anywhere in the park! I know that place so well and I’m just so comfortable there that it felt like home. I love that place like crazy. I’ve got a big announcement to make, but I think I’ll wait a few days 🙂 Build up the suspense a little. Hehehe I can’t wait to tell you guys!! My inner Padres fan was really renewed by hanging out at the ballpark and interacting with other fans. It’s like the baseball side of me has officially been awakened. I seriously can’t wait to hear some Padres baseball already!!!! WHOOO HOOOO!!!!! FanFest was incredible. Great job, Padres. This morning two trucks got loaded up at Petco Park and then headed out to Arizona. They’re expected to get to Peoria by three this afternoon. Man, that’s exciting. I can’t wait for the boys to get out there and get ready for the season. It’s going to be so great. You have no idea how excited I am about the first Spring Training game this season. It’s been so long since I’ve heard a baseball game!! It’s going to be so great to hear the voices of Ted, Jerry, and Andy calling some Padres baseball. Ahhh I can’t wait!! But before we get that far…we’ve got the Fan Fest tomorrow!!! I am so super excited!!! I can’t believe that in 24 hours I’m going to be at Petco Park. I miss that place soo much, and I can’t wait to be there. Like I said, if you see us, be sure to say hey. We love meeting new Padres fans!! I can’t wait to have an incredible day out at the ballpark tomorrow!! I am getting so excited about baseball! Now that football is finally over, we can jump back into baseball. 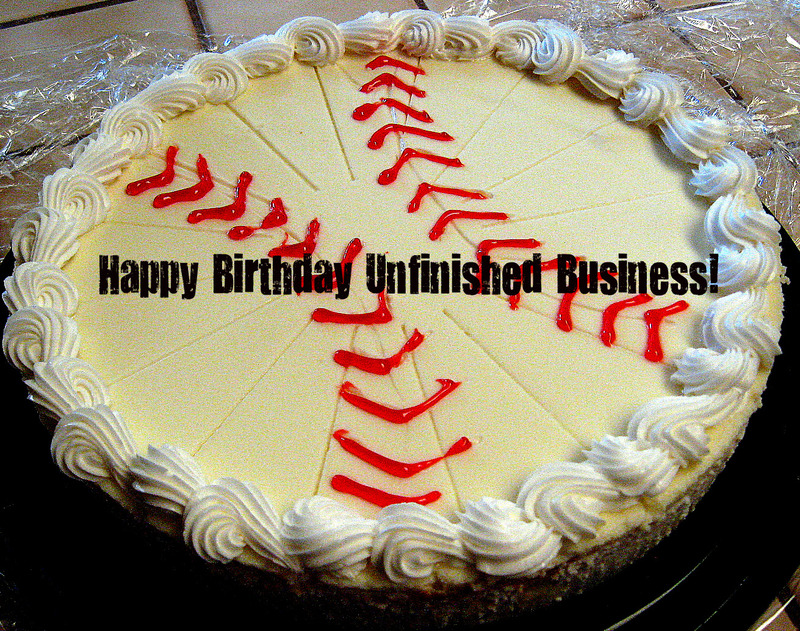 I’ve kept very busy this offseason, but I’m finally really missing baseball. Football’s great and everything, but baseball is the best. 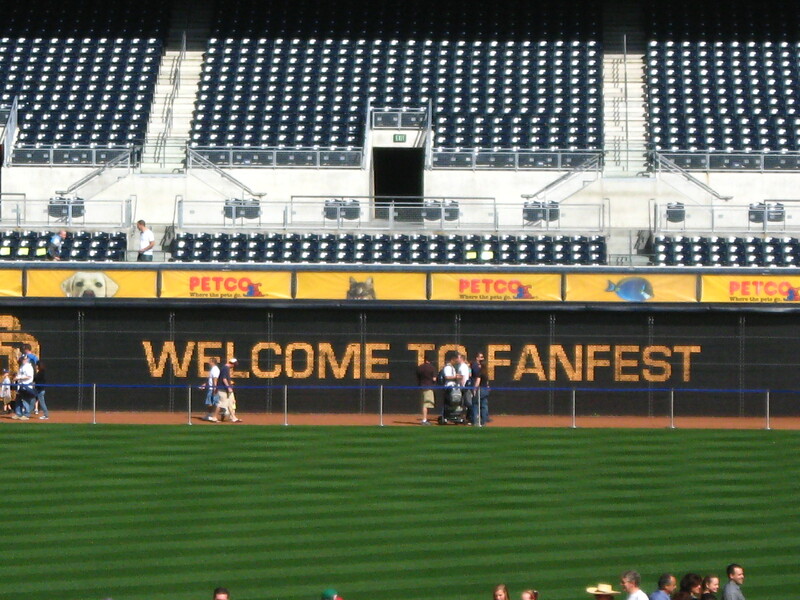 I am SOOOOOOOOOOOOOOOO excited about the Padres FanFest this Saturday!! I wasn’t entirely sure I would be able to go until a couple days ago, and now that I know that I’m definitely going, I am just super super excited. 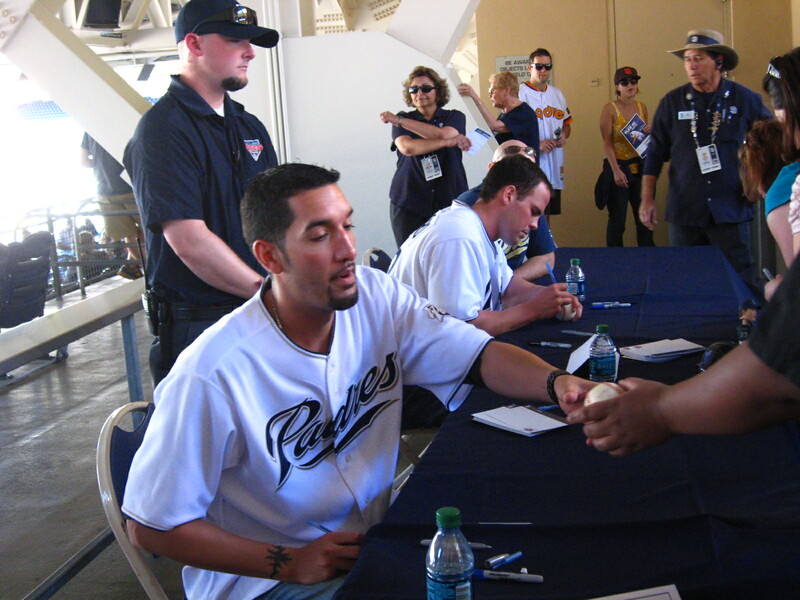 I can’t wait to get out to Petco Park again to hang out with other Padres fans and get to interact with Padres players. I’m also really excited about being able to tour the clubhouse and run (or walk) the bases and shop at the Padres Garage Sale. I’ve been to the Fan Fest once and to the Fan Day last year, and both were amazing events. I’ve been working on my amazing $10 jersey for the past few days. It was originally a Brian Giles jersey, but I’ve, uh, fixed it 🙂 Haha! It’s going to turn out so great. I will reveal it here on the blog next week after I wear it at the Fan Fest. It’s been a lot of fun to work on, and I can’t wait to wear it this Saturday! Hyun Young’s list of stuff to do at the Fan Fest is amazing, and it’s almost exactly the same as my list would be, but I’m not going to steal her idea 🙂 As you know, it’s her birthday this Saturday, and I can’t wait to hang out with her!! We’re going to have soooo much fun!! I haven’t been to Petco Park since late September! My goodness, that was a long time ago! 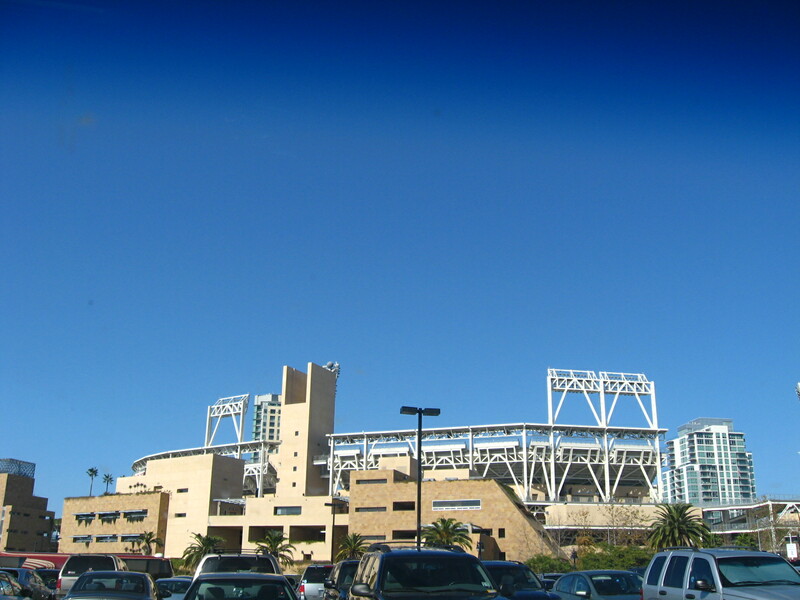 You have no idea how excited I am to see Petco again. That’s my FAVORITE place to go and it’s been way too long since I’ve been there. This is going to be such a great event. I can’t wait to spend a great day there and then come home and share stories and pictures with all you guys!! And, pitchers and catchers report in nine days!! WOW!!! Hehehehehe I’m sooooooo excited!!!! It’s going to be so great to have Padres baseball back. I miss it like crazy. Things are going to be different, that’s for sure, but I think it’s going to be a great season. I hope you guys all had a great Christmas!! 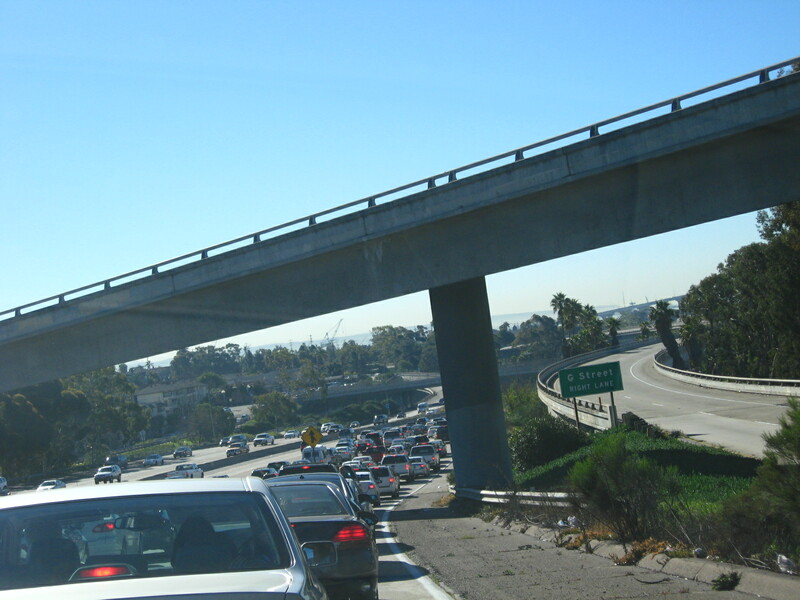 I realized how much I’ve been missing blogging yesterday, so I decided to update you guys about the latest San Diego sports news. Last week the Padres got catcher Dusty Ryan from the Detroit Tigers for cash or a player to be named later. What was really interesting to me is that this guy is only 25 years old. I thought that the Padres were looking for a more veteran catcher who would help Nick Hundley improve and maybe take a few starts, like Henry Blanco did last year. I even wonder if the Padres are going to have this guy on the roster out of Spring Training. Maybe they will still sign a veteran catcher and keep Ryan in the minors in case of emergency. But if he was on the roster, it would seem that he would not have as much playing time as Nick Hundley. I think that’s a given. 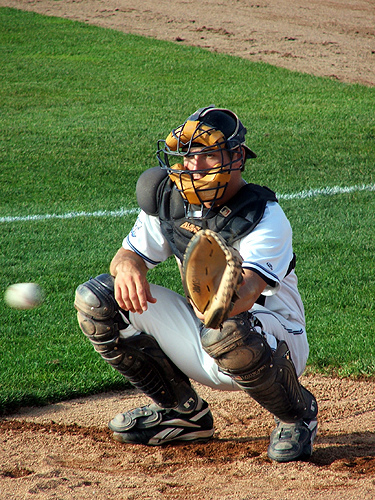 Nick is our main catcher right now, and since he’s been working with the pitchers for a full season, he will be our main guy. Ryan could get only one or two starts a week. Ryan apparently has a very strong arm, which is probably what attracted the Padres the most. Nick’s got a great arm too, but he has room to improve. Anyways, it will be very interesting to see where the Padres go with this young catcher. The Chargers played an incredible game last night to get a first-round bye in the playoffs. I am so excited about the Chargers right now. I really, really think that they’re going to get a World Series for San Diego. It’s really exciting! Now, the Padres need to get to work on locking up Kouz, Heath Bell, and Mike Adams for next year. Get it done, guys!!!! Thanks to Hyun Young, I discovered the amazingness of Gaslamp Ball yesterday. It thrilled me to see that they link my blog there! Thanks so much guys!! I do have to say, my reasons to keep Kevin Kouzmanoff entry was a little embarrassing. Sorry about that. GO PADRES!! GO CHARGERS!!! KEEP THE KOUZ!! !